Knowing how to prevent frozen pipes will help you protect your properties from major disaster and damage. When pipes freeze in your rental properties, the results can be disastrous. Prevention is the key to averting crisis. There are plenty of steps for property managers and landlords to take, to ward off disaster. Educate your renters on preventing frozen pipes and the signs to watch for, before it’s too late. Here’s what every building owner needs to know. In the winter frozen pipes are often at the forefront of every building manager’s mind. While a freeze is most common in cold climates, it’s certainly not limited to the upper Midwest. In fact, frozen pipes often occur in warmer areas during a sudden cold snap because buildings aren’t built with cold weather in mind. Pipes can freeze any time the weather turns chilly. For building managers and property owners, this presents a precarious situation. As the landlord, you may be liable for any damages caused by improper pipe installation and care. Not only could you face damages and expenses incurred to your building’s structure, but you may also be held responsible for damages to tenant’s personal property. Explore your landlord and tenant rights, as mandated under federal, state and local laws, to know where you stand should a flood occur. Meanwhile, when it comes to frozen pipes, prevention is key. Should a pipe burst, you may be facing a major flood on your property. Take proper steps to avoid disaster. Preventing frozen pipes isn’t hard, and it can save you from major trouble down the road. The first step to preventing frozen pipes is to check that pipes are properly insulated before colder weather hits. Spring, summer or early fall are all perfect times for protecting your pipes by adding simple heat tape and additional insulation. Increased insulation can also protect pipes, particularly in basement, attic and storage areas. Check the insulated areas in your building to determine if pipes are sufficiently covered. Open, exposed pipes particularly on outer walls are often at risk of freezing. During warmer months, take time to thoroughly inspect pipes throughout your building. Watch for any leaks or areas of concern. Pay particular attention to water stains and small leaks reported by tenants. The time to address these leaks is during warmer weather. Inspect and repair any cracks or drafts near your pipes. Simply caulking or using a foam sealant can prevent the spread of cold, icy air when winter comes. Inspect your weather stripping, particularly in vacant units to ensure your building offers plenty of protection for your pipes. Keeping up on small repairs will not only ensure the safety of your building, but it will help you attract good tenants. At the end of the summer season, drain all outside lines including sprinklers and hoses. As you’re winterizing your machines and equipment, check your grounds for any areas of concern. If your building has any water features, a hot tub, or a pool, thoroughly drain, cover and prepare for winter. Outdoor pipes are highly susceptible to freezing as are pipes on outside walls, so inspect your property and grounds. Clean your gutters and downspouts and thoroughly inspect the roof of your building for any leaks or pools of water, which can indicate a drainage issue. 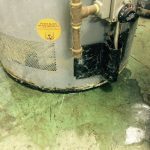 It’s important to identify the cause of any leaks in your building and address them now. Early detection of frozen pipes prevents bursting and if you or your tenants aren’t sure about the cause of a leak, it may be ignored or brushed off until you’re facing a flood. If you’ve placed digital thermometers near your pipes or outside walls, check them before the season begins to ensure batteries are in good working condition. A digital thermometer can alert you if temperatures fall into a lower zone where you should be concerned about the possibility of pipes freezing. Building managers probably want to consider an inexpensive remote temperature monitor, especially if you spend much time off-site. Remote sensors start at $50 and more complex devices go up from there, but it’s well worth the investment. A remote temperature monitor uses a digital thermometer to measure changes in room temperature surrounding your pipes. The thermometer sends alerts to your phone (or computer) if temperatures drop while you’re offsite. Service all your building equipment regularly, but especially focus on your boiler system, water heater, and heating devices. If your building uses electric or radiant heat, you’ll need to have a technician come out to inspect your equipment well before winter. It’s a good rule of thumb to request a technician visit at least once a year, especially when monitoring multiple buildings and sites. A broken pipe or equipment failure can leave your residents without heat, hot water or worse. Depending on your state and local laws you could be held liable for any damage or associated repairs if you didn’t take proper precautions. If you need to have your commercial water heater serviced, don’t hesitate to call a Reliable Water Services technician, available 24/7. Once winter arrives, teach your tenants the signs of frozen pipes. Most people think that if a pipe’s frozen, the water won’t turn on, but that’s not always the case. The pressure may be diminished, and water may slow to a trickle, but they may still have some water. Any water pressure concerns or changes should be reported to the building manager right away. Another sign is a strange smell emitting from the drain or seeing water backup. If water can’t flow freely out of the pipes, it will stay in the drains causing an odor. This could also indicate a clogged pipe, so urge tenants to report any issues that they notice. Additionally, frost on the pipes is a big indicator your pipes are too cold. Lastly, of course, your tenants should report any leaks or water spots as well. A pipe may crack rather than burst, leaving you with a slow leak. Your tenants are your first line of defense when it comes to detecting frozen pipes before it’s too late. Urge them to contact you, rather than attempting to heat the pipe and resolve the issue themselves. Should a pipe burst, tenants should contact you immediately! Turn the water off at the main shutoff valve (at the water meter or point of entry). Notify tenants of a water outage and contact a plumber right away. Running water won’t freeze, and even a slow, small drip will prevent the pipes from freezing. Pay attention to the spot where pipes come into the unit from the outside and turn on a cold drip in a faucet as far away as possible. This ensures water runs throughout the entire system in the apartment unit. The only exception would be if the entire building is vacant, in which case, drain the system by shutting of the main valve and allowing all water to run until it stops. If you’re dealing with just a few vacancies, simply turn on a slow drip. You should also leave the cupboards and cabinets open if they house any pipes (such as under sink cabinets in the bathroom and kitchen. This allows warmer air to reach the pipes. Keep in mind that pipes won’t usually freeze if the outdoor temperature doesn’t dip below 20 degrees, but it’s still best practice to protect your pipes under any freezing temps. Check your vacant units regularly, particularly after a cold spell. An undiscovered pipe burst can cause irreparable damage, so you’ll want to check in regularly, so you can take action right away. Encourage your tenants to leave the heat on, even if they’re heading out of town for a few days. Internal units may be insulated well enough by neighboring apartments, but empty external units are at risk. If a unit will be empty for more than a few days, the heat should be kept at a minimum of 55 degrees. For vacancies, basements and communal spaces, don’t spare the expense of keeping the heat on. Apartments don’t need to be heated to comfortable living temperatures, but protecting your pipes is well worth the cost of the electricity or gas. Be prepared by keeping your building’s heat on, even if it seems unnecessary. Protecting the pipes in your building is important all year long. We often think of preventing frozen pipes during winter months and in colder climates, but keep in mind: often frozen pipes usually occur during unusual and unexpected cold spells. Buildings in colder regions are built with the weather in mind and pipes are often located on internal walls. In warmer climates, these building precautions aren’t always taken. There are steps you can take all year long to ensure your pipes are safe, no matter what comes your way. Features image via Scott Akerman on Flickr. All images licensed for use via CC by 2.0.